One last visit to Jackson, California, as the summer days approach their end, is sure to evoke memories of summer camp, the fun and friendships, whether they be a month ago or years and years. These were the feelings shared by clergy as they arrived from all directions of the vast Western American Diocese for the 22nd Annual Diocesan Days which officially began Friday, August 31, 2018. Greeted and warmly welcomed by their diocesan hierarch and spiritual father His Grace Bishop Maxim of Western America, the clergy were escorted to the hall where a delicious lenten meal was prepared to strengthen them after their long journey. During the luncheon, the bishop introduced hieromonk Papa Ephraim who recently transferred to our diocese and is serving the Skete in Alaska. Papa Ephraim, in turn, was asked to introduce this year’s guest speaker whom he has known for many years: Rev. Deacon Stephen Muse. Also introduced were special guests Professor Dejan Ristic who was accompanied by three seminarians from the Prizren Seminary in Kosovo. A clergy seminar followed lunch led by this year’s guest speaker who is a pastoral counsellor and marriage and family therapist. His talk entitled, The power of Helplessness, Before the Face of God in the Struggle to Free the Hidden Person of the Heart, was insightful and pastoral, and filled with many anecdotes from his many years of dealing with various psychological issues and situations. At the beginning of his presentation he asked the simple question – when Jesus was at the Garden of Gethsemane why did His Disciples fall asleep as they waited for Him. While the answer is seemingly an easy one pointing to their weak human nature, Fr. Stephen delved deeper into sleep being a sign of their helplessness – indeed, our collective human helplessness. Ultimately it is a part of our human nature so that we can achieve nothing without Christ who acts in us. He interrupted his talk and asked the clergy to share their own experiences of helplessness, of pain and sadness that they might have experienced in their ministry. 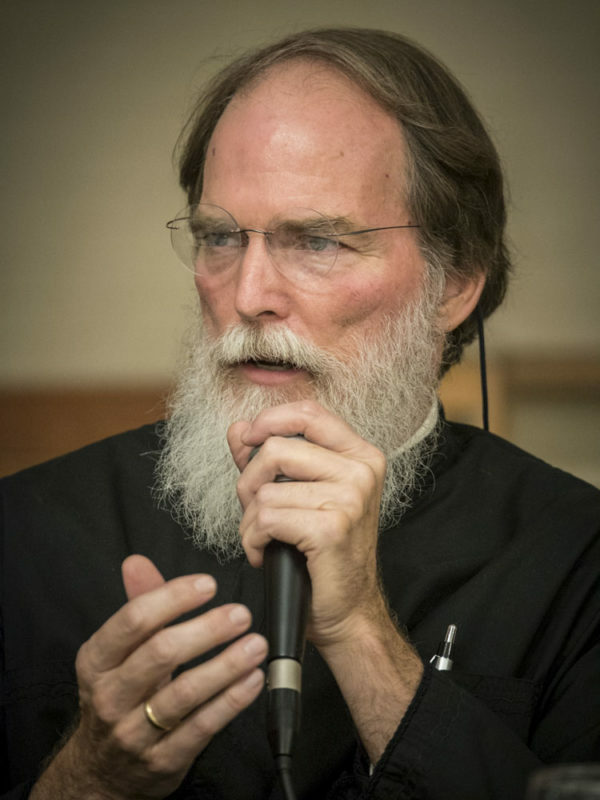 In responding to the priest’s comments he used both the patristic fathers and his vast knowledge of psychology, offering a wonderfully warm and pastoral message. The discussion lasted throughout the afternoon hours. 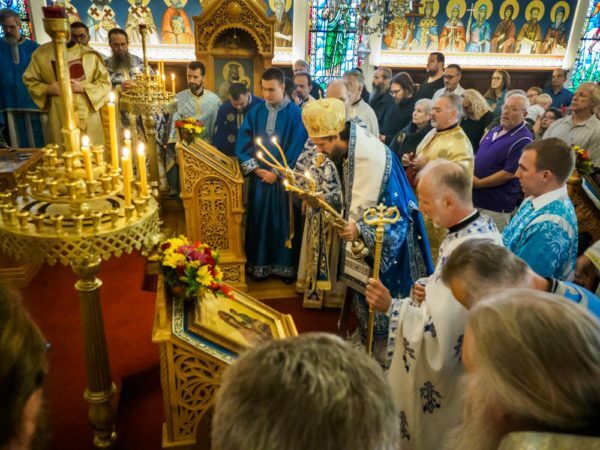 “Whenever we serve a liturgy at the relics of a Saint it’s a feast day,“ said Bishop Maxim at the conclusion of Saturday morning’s Holy Hierarchical Divine Liturgy. The liturgy, which began with Matins, was served at the St. Sava Church and officiated by His Grace Bishop Maxim of Western America with the concelebration of all the clergy of the Western American Diocese. Following a continental breakfast and fellowship, the Annual Diocesan Assembly was opened with the Lord’s Prayer at the St. Sava parish hall. During the meeting, reports were heard from the diocesan bishop, treasurer, audit board, and representatives of various other organizations and groups. 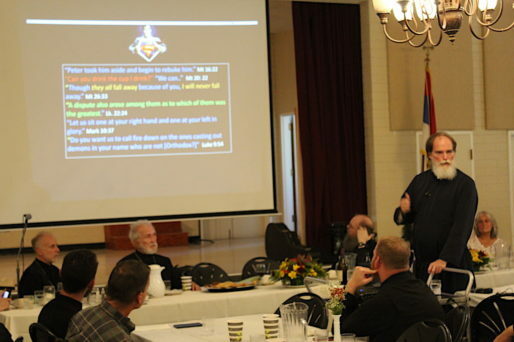 A detailed financial report was presented, looking not only at the mundane day-to-day income and expenses, but touching upon all the many activities and programs the diocese wants and feels they need to be doing, all of which require the financial means in order to be accomplished. Parishes were thanked for paying their assessments on time, a clear indication the diocese is heading in the right direction towards a bright future. The meeting was conducted in the spirit of Christian love and understanding “decently and in order“ (1 Cor. 14:40). The lunch afterward led to Rev. Deacon Stephen’s lunch Symposium entitled, The Way, the Truth and the Life of the Cross, which he began with a quote from the Liturgy when the priest says in one of the prayers, “through the Cross joy has come into the world“, pointing to the paradox of joy coming from the horrific event of the crucifixion of our Lord. Or, in the words of Cicero: “To bind a Roman citizen is a crime, to flog him is an abomination, to kill him is almost an act of murder; but to crucify him is what? There is no fitting word that can possibly describe so horrible a deed“. But it’s through the Cross that God reveals His love for mankind; indeed, that love itself is revealed. Through his many vivid anecdotes, he pointed to man’s thirst for love, which he seeks from his neighbor and, at times can be deceiving. For instance, we might say to someone I love you but in reality what we mean is that I love what you do for me, or help me, or give me. What’s more, that love we vseek as bodily nourishment is unfulfilling unless it comes from God. For this reason, the fruit Adam and Eve ate without God’s blessing was not filling, but quite the contrary, it only revealed their nakedness, emptiness – their helplessness. Humanity lives by the Logos and not the nourishment of this world, or as the Lord says, “Man doesn’t live by bread alone…“. We see this nakedness, this helplessness, in the image of the feeding of the five thousand for example when the Disciples tell Jesus that there are many to feed but all they have is five loaves and two fish. The Lord’s response is: Bring them to Me, for all things that are brought to Christ are multiplied. Thus, man is to be a perpetual anaphora, offering. But if Christ on the Cross is offering us everything – complete and unconditional love – how can we meet Him if we don’t go to that place we fear, that dark place in our hearts? That place in ourselves which we mask and ignore and try to forget, yet it is only Christ and His Cross that offers us healing and fullness – and only if we offer it up to Him. As he quoted in one of the slides during the presentation: The Cross is the presence of God in humanity’s experience of the absence of God. During the late afternoon hours a Women’s Conference and SKSS Meeting were held, youth activities were offered and fellowship was enjoyed leading up to the evening’s Vespers service under the tent on the campgrounds. Vespers was followed by dinner during which the seminarians performed to the delight and enjoyment of all. 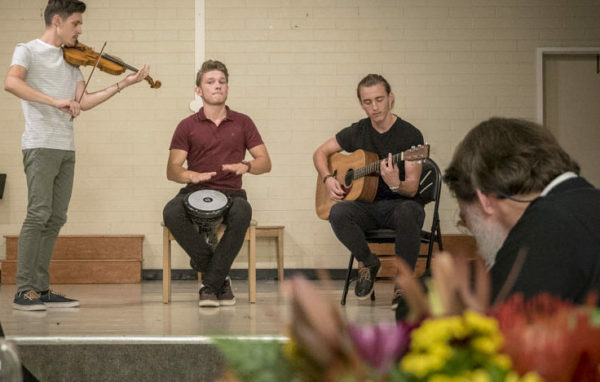 Later, a live band from the nearby Fresno parish performed to the late evening hours as the hall continued to be filled by Serbs who traveled from neighboring towns with the desire to take part in this year’s Diocesan Days. The program during the banquet opened with a hymn to the Mother of God performed by Cellist Popadija Biljana Bojovic. Rev. Deacon Stephen, in his keynote address, offered a personal summation of the past few days, the different sounds and tastes and sights he had enjoyed and taken part in. “To taste is to discern,” he said, adding that the Hebrew word for taste is also the word for discernment. In other words, all that we take in is to be refined by the sobriety of heart. God breathed into the earth and man was given life by God’s divine breath. Thus, breathing is liturgical, it is an anaphora. We do not choose to breathe or not to breathe, we either breathe or die. We take in the tastes around us but are also called to discern whether they are good or bad. In a story of a Jewish rabbi that he shared, the rabbi tells his student to place prayer on his heart. The student is puzzled and attempts to correct his teacher by telling him that prayer should be placed in the heart. “But no human canplace prayer in the heart,” he noted, “it is placed on the heart so when the heart breaks it falls inside.”Subsequently, our only goal in prayer is eschatological – we yearn for God’s Kingdom, His presence, not as a future event but that He be with him. On that note he thanked Bishop Maxim for his invitation and the opportunity he was given to speak to those hungry for Christ. The seminarians from Prizren performed a few selections, assisted by Popadija Biljana. As a humble token of appreciation Fr. 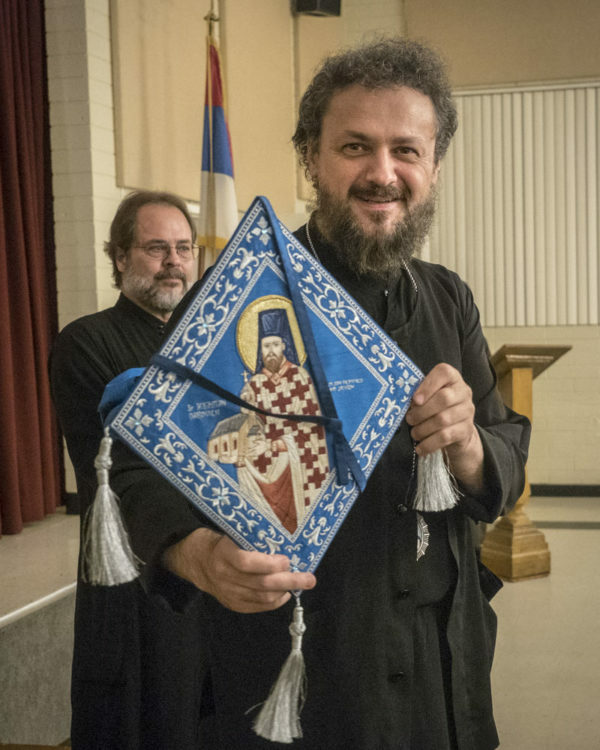 Marko Bojovic, the host priest, offered gifts to the guest speaker, Professor Dejan Ristic and the students from Prizren Seminary, Papa Ephraim and Fr. Boris Colovic visiting priest from the Diocese Zahum and Hercegovina who has been serving the Salt Lake City parish. Vice President of the Diocesan Council Ron Radakovich made an announcement regarding the publication of the monumental monograph, The Serbian Christian Heritage of America. “As I predicted,” he said, “we have passed the $50,000 mark in sponsorship for the monograph this weekend”. The banquet and program ended with prayer and Bishop Maxim’s words of gratitude to all that helped in hosting, to those that attended and everyone that works for the prosperity of the Serbian Orthodox Diocese of Western America.